Take the Red Line to Alewife. Walk out of the station toward the Rindge Ave exit. You’ll see Summer Shack restaurant ahead of you. Once you’re at Summer Shack corner, immediately cross to the opposite side of the street at the light. Walk over the bridge (over railroad tracks). Option 1 (15-min): Walk all the way down until you reach a roundabout and make a left on Concord Street. Walk until you reacher another immediate roundabout, take a left onto New Street. We’re located on the right. 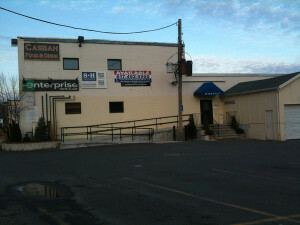 We’re in the same building as the Enterprise Car Rental and Casbah restaurant. Option 2 (8-min): There is shortcut where you don’t have to walk all the way down to the roundabout at Concord Street. Right after the bridge there is an unofficial foot path* that goes right into the Fresh Pond Mall parking lot on the Staples side. You can then walk on New Street between the Cinema and Staples. We’re located on your left side. We’re in the same building as the Enterprise Car Rental and Casbah restaurant. Option 1 (10 min): Depart from Harvard Upper Busway and Redline. Take the 78 (towards Arlmont Village via Park Circle & Blanchard). Arrive at Concord Ave and New Street. Walk 2 minutes to 26 New Street. We have lots of parking onsite at Q Ballroom (formally called Extreme Dancesport). In addition to that, you can park in some of the nearby businesses. However, please DO NOT park in the lot belonging to the gym, Evolve Fitness, next door.